A restaurant point of sale (POS) system is key to operating a successful eatery. The restaurant industry is facing evolving customer behaviors, increasing labor and food costs, and growing competition. To survive these changes, you need to take advantage of every opportunity to improve efficiency, reduce waste, control costs, and make customers happier. A restaurant POS system will give you the foundation to make all of those things happen. 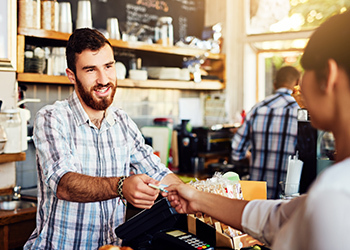 Generally speaking, all point of sale systems gives merchants the ability to streamline the checkout process, provide payment processing so you can accept credit and debit cards, and reporting and analytics so you can make smarter business decisions. However, that’s where a lot of the similarities end. When it comes to point of sale systems, it’s not a one size fits all approach. Restaurateurs and retailers have very different needs when it comes to choosing the POS system that meets their business needs. If you operate a full-service restaurant and bar, you’re going to need a point of sale solution designed specifically for your industry — a restaurant POS. To narrow your choices of a POS system for your business, an excellent place to start is identifying solutions for the specific type of restaurant you operate. You build a restaurant with great food and great dining experiences, and your point of sale system should be an extension of that. Therefore, POS features should include the ability to take reservations over the phone or let customers make reservations online. Table management is another essential feature for full-service dining so you can seat guests quickly and turn tables faster. Consider a restaurant POS that gives you the option to add Mobile Point of Sale (mPOS), so wait staff can leverage tableside ordering as a more efficient order taking process. It also gives customers the convenience and security of paying at the table. Restaurant POS systems designed for fine-dining also include a coursing feature for perfectly timed meals. In fact, the right POS system supports every stage of your guests’ dining experiences with exceptional service. Fast-casual POS systems require many of the same features as a full-service restaurant solution, but there are a few nuances that make them different. For instance, you may want to add table kiosks for self-ordering menu items or pay-at-the-table functionality. Your business may also want to capitalize on the growing online ordering trend. To make this new revenue opportunity work for your business, integrate online orders with your Kitchen Display System (KDS) for a streamlined workflow and accurate orders every time. Your POS system can also print receipts and labels that help your staff match the right orders with the right customers. Customers choose your quick-service restaurant for convenience and speed of service as well as the great food. Your restaurant POS system needs the power to quickly process orders and payments so you can keep the lines moving. Self-service kiosks are a great way to help keep lines moving and maximize revenue. A POS system designed for QSR will also include integration with digital signage. Digital menu boards are an excellent way to present your menu offerings in an easy-to-read format, and they’re easy to customize for special promotions. Using your POS system, you can accurately and consistently update menus and menu displays — an especially important feature if you manage more than one location. Point of sale software for bars and nightclubs are especially demanding because of the nature of the business. During the day, a POS system in a nightclub sits dormant. However, at night it sees more action than Sylvester Stallone in Rocky. You need a POS system that can take the heat, especially during high volume times. Your bar and nightclub POS system should also automatically facilitate happy hour pricing, based on a set time frame. Also, speaking of drinks, a nice-to-have bar feature is a liquor control system that measures inventory by bottle weight or a pour monitoring system that measures stock used per pour. Your POS system will also feature secure cash management to reduce shrinkage. Bar POS systems will enable you to preauthorize a tab, so you don’t have to hold on to the customer’s credit card, and you can verify the card and confirm there are funds to cover the tab in advance. Bar POS systems also include age verification processes to ensure your business is complying with the law. If you own a pizzeria — especially one that offers a delivery service — your business has a few unique requirements that don’t necessarily fall into the QSR or fast-casual category. For restaurants offering delivery, your point of sale system should integrate with caller ID, so the customers’ contact information and order history are automatically populated as the call comes in. Further down the delivery road, a pizza POS system should also have directions and mapping features so all your drivers can reach a customer’s home in a timely manner. Lastly, your POS system needs to accommodate the unique menu items and numerous combinations your customers can order such as toppings on a half pie or a whole pie. It also has to help you manage inventory and raw goods, so you don’t run out of those favorite toppings. Your POS system can track inventory based on orders and notify your wait staff when it’s time to 86 a menu item. Also, restaurant POS systems can monitor expiration dates to help minimize waste, and generate purchase orders when stock runs low. The right inventory management system can also streamline stock counts and monitor activity to help you pinpoint sources of shrinkage and food waste. Restaurant POS solutions make it easy to manage both front-of-house and back-of-house employees by tracking hours, sales, and shift performance. Your staff can use their IDs to clock-in and clock out on POS terminals, and you can receive alerts if an employee’s schedule includes overtime. Your point of sale system reporting feature will give you insights into shift reports for easy cashout and overall employee performance and the impact on revenue. Add efficiency and accuracy by transmitting orders directly to the KDS. This capability eliminates the problem of lost tickets or orders prepared incorrectly due to illegible handwriting. Your system can assign parts of the order to the appropriate food prep station, so all items are ready at the same time. Manage your loyalty rewards program with your restaurant POS and make it easy for your customers to earn and redeem rewards at any of your locations or online. Your point of sale should also have the ability to issue and accept gift cards — an excellent way to increase brand awareness and revenue. According to the National Retail Federation, gift cards continue to top the list of the most popular gifts, with restaurant gift cards ranking as the most popular. Use your POS system to manage your customer database to create target email campaigns with relevant offers and messaging. You can also use this tool to entice customers who haven’t visited the restaurant in a while with a special offer. Analyzing data from your CRM will also reveal which marketing campaigns are most effective, showing you the path to the highest ROI. Once you select restaurant POS software, you need to choose hardware that’s purpose-built for reliable use in a busy restaurant environment. Touchscreen POS terminals enable quick order entry, ruggedized tablets for tableside service won’t need replacement after a drop or a spill, and an impact printer produces tickets that won’t fade in a hot, humid kitchen. POS hardware also includes payment card readers, cash drawers, and receipt printers for efficient checkout. Additional POS hardware and peripherals can provide added-value, such as tablet stands, barcode scanners, scales, kitchen monitors, customer displays, and kiosks. As you evaluate restaurant POS software features, remember that it should be easy to use. In an industry with a higher-than-average employee turnover rate (more than 70 percent, according to the U.S. Bureau of Labor Statistics) it’s vital that restaurant POS software is simple to learn so new employees can work independently sooner rather than later. Excessive training time will eat into your profits so make sure your POS system is user-friendly and intuitive. Many POS systems feature touchscreen interfaces, like the screen on an employee’s mobile device, which significantly lowers the learning curve. A POS system will also help your employees be more productive — if it provides them with the right tools to do their jobs. Keep in mind that there are many different POS systems for restaurants, and their features and user experiences can vary significantly. Choose a restaurant POS system that will improve the efficiency of your existing processes — not one that you have to change your processes to use. If it is a cloud POS system, does it have offline capabilities? Can I use it as part of a hybrid local server-cloud system for business continuity? Can I accept all types of payment including EMV, contactless and mobile wallet payments? Can I add new functionality and will it scale with my business as it grows? Is a point of sale app the right choice for my business? Can I access the system and reports so I can manage my business from any location? Does it integrate with accounting software or other restaurant back-office software? Is the POS system cost within my budget? Are there additional costs I will need to budget for as I use the system? It’s also wise to evaluate the POS system provider. Work with an established company with experience in your industry and with a good track record providing excellent customer service and technical support. The restaurant POS you choose can impact your business’ efficiency and profitability for years to come. Take the time to carefully evaluate your options and make a choice that will provide your business with the greatest value.